April 13th 2018 - April 12, 2018 – Palm Beach Gardens, FL – Eighty players participated in the 2018 Club Car Pro-Official at Frenchman’s Creek Country Club presented by Earth Networks. Blustery winds made conditions tough, but players were still able to find birdies out on the par 72 layout. Low professional of the day was Brian Peaper, PGA Director of Golf at Lost Tree Club with a 3-under par round of 69. Our 2018 Low Gross Champions was the duo of Brian Peaper, PGA and Biff O’Reilly of Lost Tree Club with 7-under par 65. 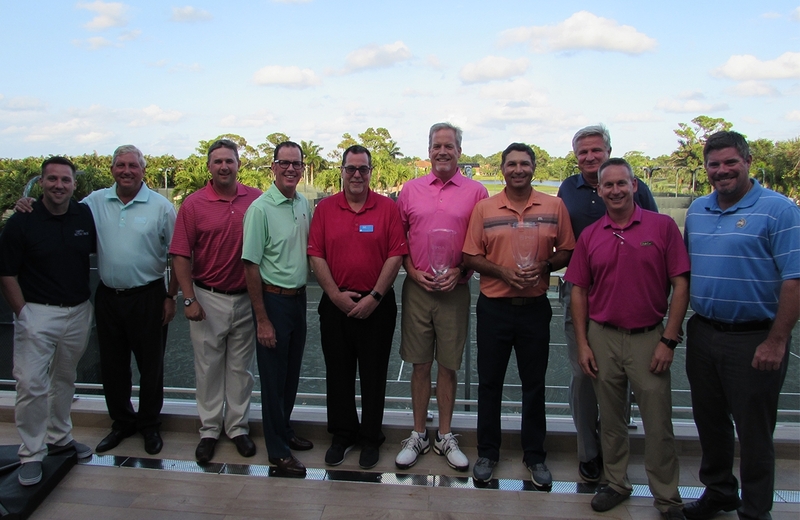 The team of Richard Terga, PGA and Patrick Pettit of Jupiter Country Club claimed Low Net honors with a 10-under par score of 62. Thank you to Frenchman’s Creek Country Club for going above and beyond in hosting this great event for our PGA members and their officials. We also appreciate our great partners of the event: Club Car, Earth Networks, Birdie Box, Levelwear, and Precise Yardage Books.